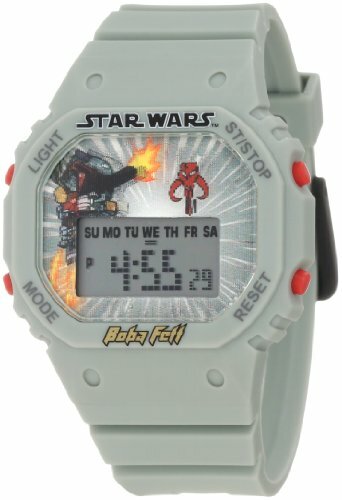 The Star Wars Kids' Boba Fett Digital Watch is a stylish kids watch with an LCD display and features Boba Fett in a Star Wars image with a neat 3D effect. This cool gray watch has a matching strap while the digital display with an EL backlight makes it easy to read the time, even in the dark. Tell time and see the master Mandalorian bounty hunter come to life with the Star Wars Kids' Boba Fett Digital Watch.